Tuesday, March 27, 2012: Up and on the road at 0955…..leaving Bryce Canyon National Park under mostly sunny skies and a temperature of 31 degrees. After three great days exploring this magnificent park we vow to return soon. At this rate we will have to live to 103 to see and/or return to all the incredible places the US has to offer. Wonder why some folks fly across the pond to tour foreign countries and ignore the sights in their own backyard? 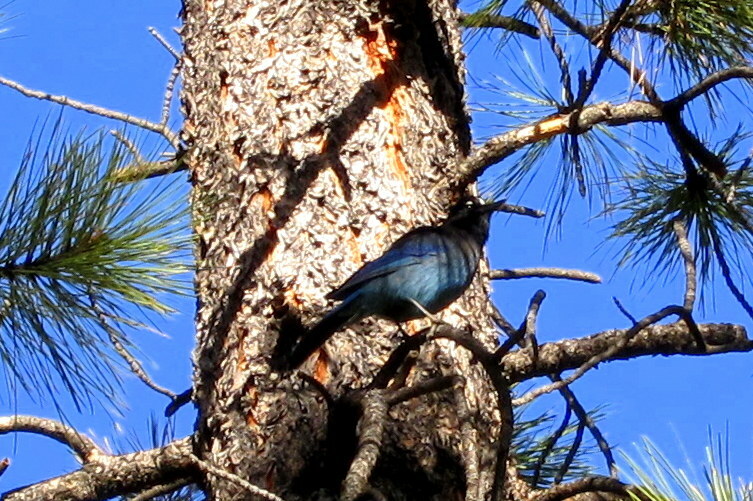 As we meandered our way through the campground we spotted this colorful bird in a pine tree. My crude bird ID skill combined with the phone app iBird leads me to believe it may be a Stellar Jay. I hope if I’m wrong, that my bird expert friends David or Dewey will set me straight. If you ever find yourself wondering what a particular bird is, then the application iBird Pro is a handy reference. It is available for either iPhones of Droid machines at a nominal price. Following state highway UT-12 we connected to US-89 and began to make our way northerly. 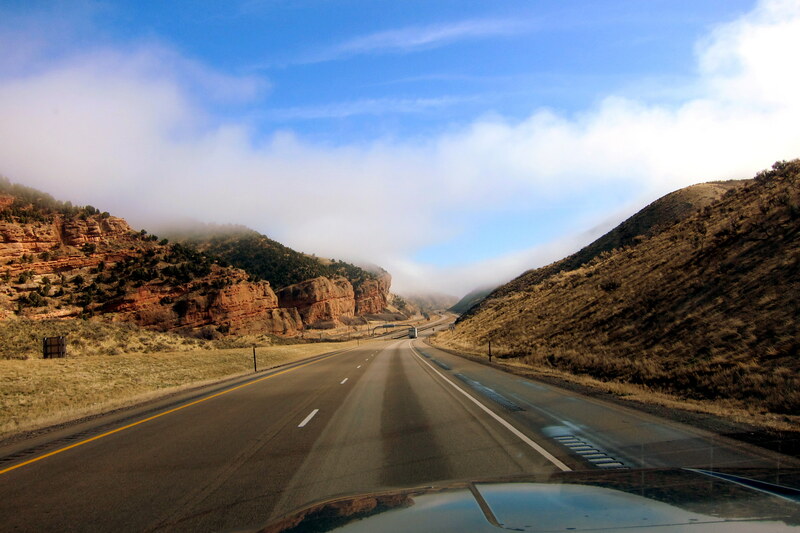 Interstate 70 is a few miles to the west and basically parallels US-89 but, as has been our modus operandi, we prefer to stay on the back roads. In fact we feel silly if anyone spots us on any major turnpikes…..wonder why? Yea, I know that the truck registration will likely expire before we return home. That’s the beauty of a Veterans Plate…..most cops are Vets! 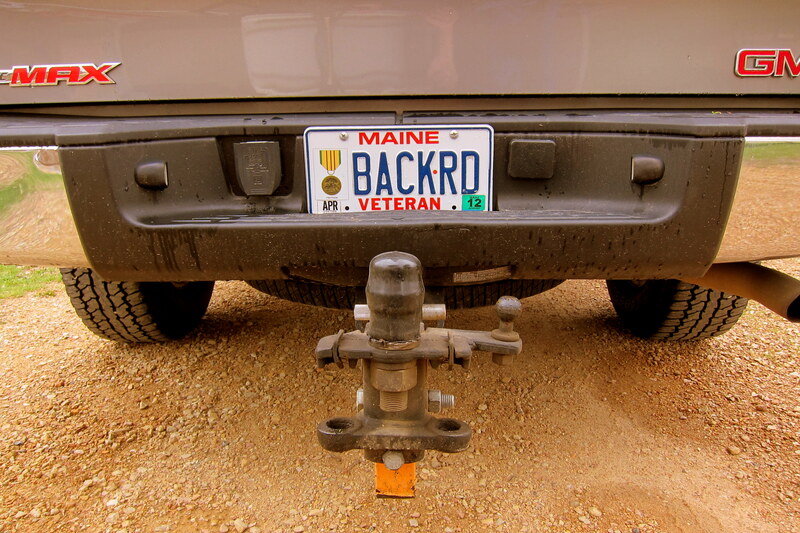 However one fella asked when spotting the license plate…..”What’s a Maine Backward Veteran?” Tried to convince him that everywhere I drove was in reverse. I think he actually believed it!?!? On the narrow two lane back roads that we prefer, Kit is a valuable asset. Constantly looking about for any potential road hazard and she also frequently “helps” Lucy with the navigation chores. Here is a photo of Kit on vigilant watch. 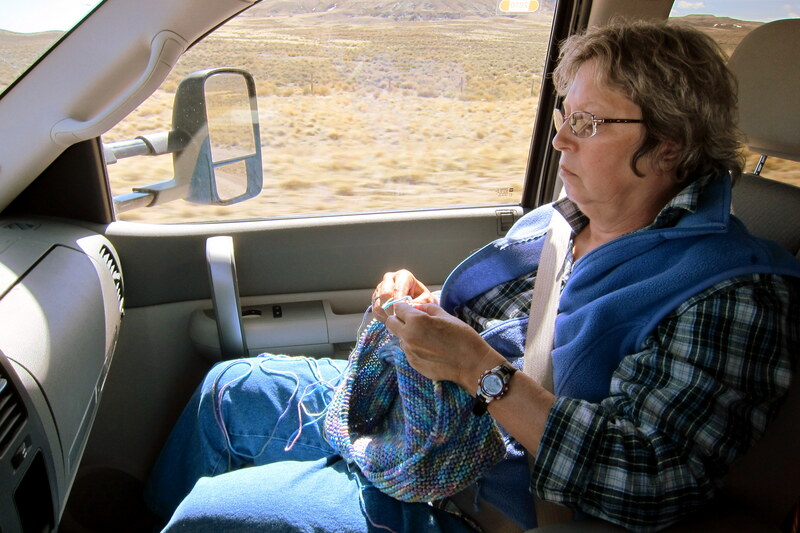 Hope we don’t get stopped by the Homeland Security folks as I think she is knitting an Afghan. It’s a good thing that Kit is constantly scanning the road ahead as occasionally whole mountains will jump up in front of our intended path of travel. 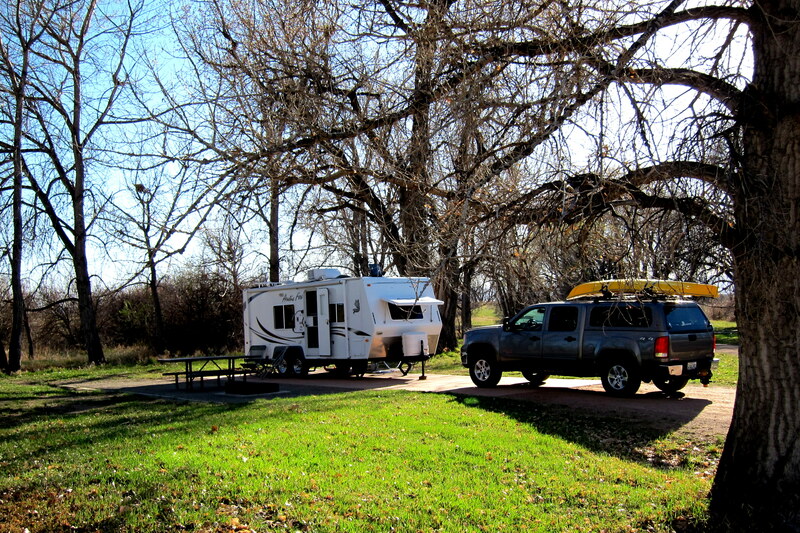 Now you may be questioning our sanity, traveling as we are north into what is sure to be colder weather…..especially considering that our home on wheels can essentially be pulled anywhere. Well we have promised to do a favor for a dear friend and that requires us to visit northern Colorado. So it was either up and over the Rockies via the Vail Pass or more northerly toward Cheyenne, Wyoming. Considering the projected weather forecast for snow and ice at elevations above 10,000 feet we stayed on the west side of the mountains to ensure safe passage. 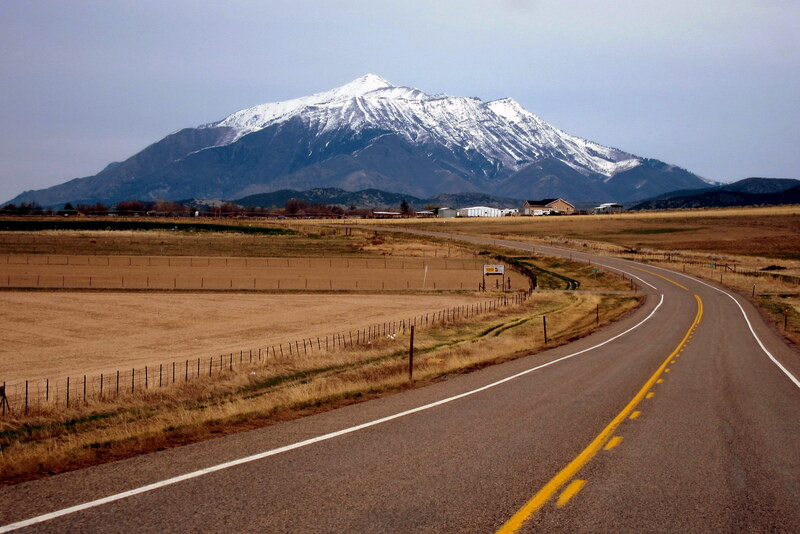 We traveled through many small towns…..such as Panguitch, Circleville, Junction, Marysville and Gunnison before fighting our way through Salt Lake City traffic to Hill Air Force Base in Layton, Utah. Since it was after 1600, we decided to pull in for the evening at the campground where we selected a site next to an interesting family from Texas. These nice folks were living, traveling and homeschooling their two boys in a nice large fifth wheel trailer. The father, an Air Force sergeant was in the bomb disposal business and frequently was called upon to travel to various bases to ply his trade. On one assignment he and his family (sans trailer) lived on the Puerto Rican island of Culebra. He was there to help clean up a defunct Navy bombing range on the nearby island of Viegues that I had previously spent many a day offshore helping to deposit lead on. Even though their family disagreed with this couples way of life, we believe they are living an ideal existence, well….maybe except for the unexploded ordnance handling business. They keep an online journal as well and we intend to follow their travels and exploits. Wednesday, March 28, 2012: Today is a down day. Spent it dumping tanks, sanitizing the fresh water system, tightening up loose screws and hinges, doing laundry, and otherwise relaxing. 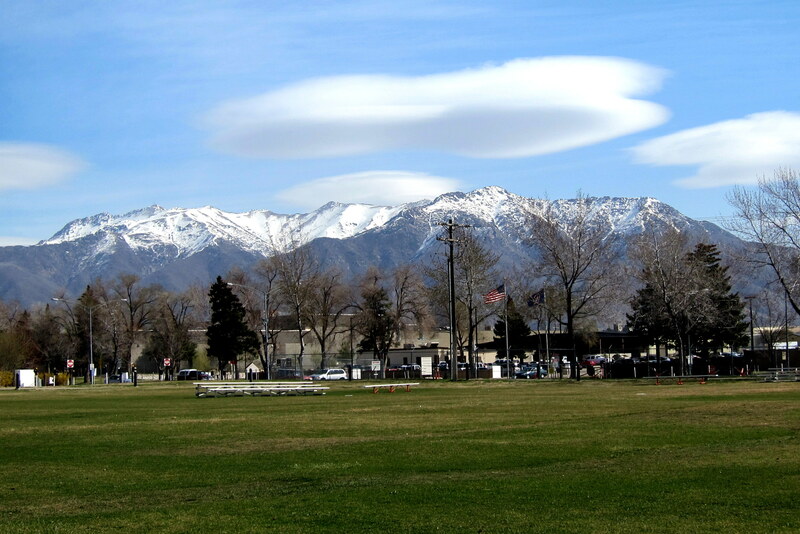 Hill Air Force Base sits in the shadow of the Wasatch Mountains and is home to the Worldwide Logistics Group, supplying everything from aircraft to staples to forces throughout the world. The campground is across the street from the USAF gym and next door to a very nice walking track. With I-pods in place we walked many a lap in the 65 degree sun before settling in for a good nights sleep. Thursday, March 29, 2012: Up and on the road at shortly after 0900 under partly cloudy skies and temperatures in the low 40’s. Choosing US-84 we headed east up into the mountains. Soon we were bumping up against the clouds with steep mountain peaks on either side. Hooking up with I-80 we spent the majority of the day staring at high elevation pointy roads. Interrupted only by the sporadic mountain which the highway engineers decided to punch a tunnel through. 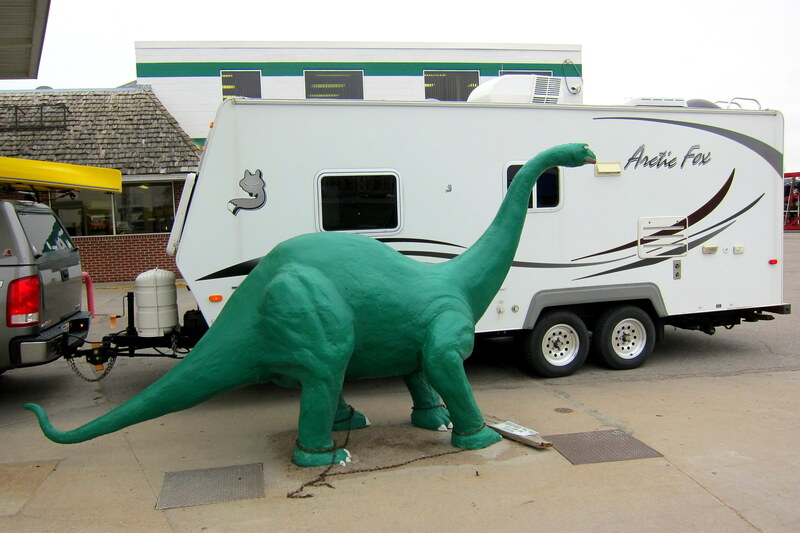 At 1040 we crossed over into Wyoming and pulled into the welcome station where we were met by this fellow. 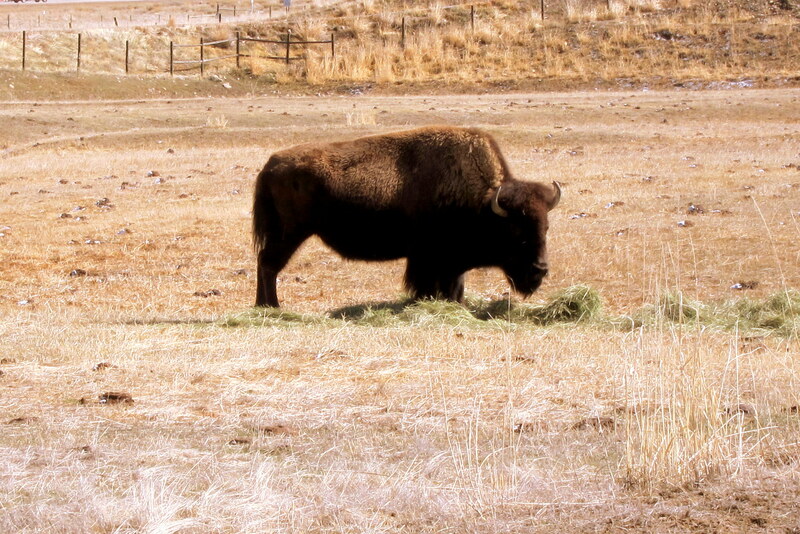 The sign sez the critter is a Bison…..not sure how it differs from a Buffalo, but either way it’s a big mother. Yea, you read right…..the sign also said it was expecting and was planning a natural childbirth. Her name is “Quasimodo”…..well, that’s what I named her anyway. Yea I know it’s cruel and I should be ashamed of myself but it is very near Easter after all. On closer examination (of the photo…..not the Bison) I notice a beard and horns……maybe the critter is a big father instead, which would be an animal husbandry miracle. I’m much better with smaller animals, those with similar sized brains as mine…..like this little fella who was flitting about. Kit quickly looked it up on iBird and believes it to be a Magpie. Again, please tell us if we are mistaken. 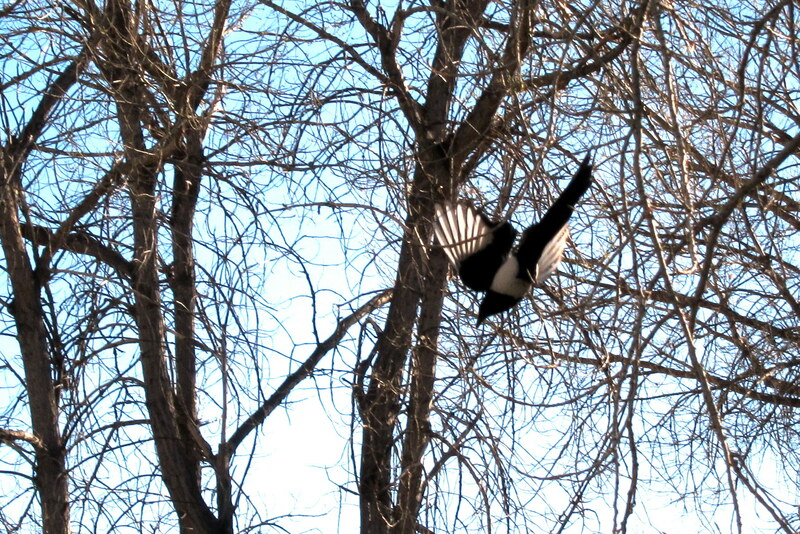 The Magpie was striking as it took flight…..not in the “bombardment” sense but in appearance. The stark black and white bird was incredible looking as the wings were almost translucent flashing in the morning sun. At 1426, and again at 1630 we crossed the Continental Divide…..not sure how that happens unless we were going in circles! Stopped for a break at a state rest area in the middle of nowhere. It has been windy all day and as I climbed out of the truck a valuable Wal*Mart bag took to the wind with Kit in hot pursuit. A hundred yards away she tackled the errant bag as it was slowed by a snow fence and triumphantly raised her arm in the traditional Wal*Mart victory salute. Thanks to Kit, another beautiful and pristine environment was saved from the scourge of Witches Knickers! 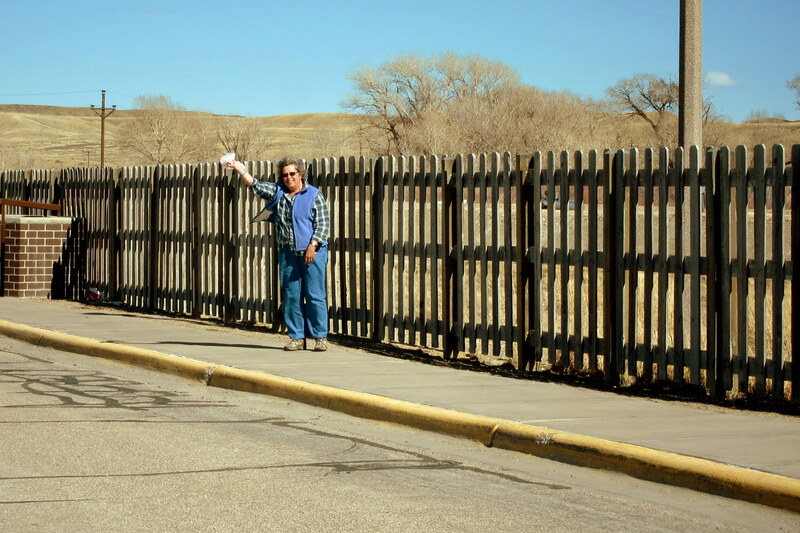 It is 1840 and after a very long, and obviously boring day, we pull into Cheyenne, Wyoming. Where we locate Warren Air Force Base and make our way to their sparsely populated campground for the evening. 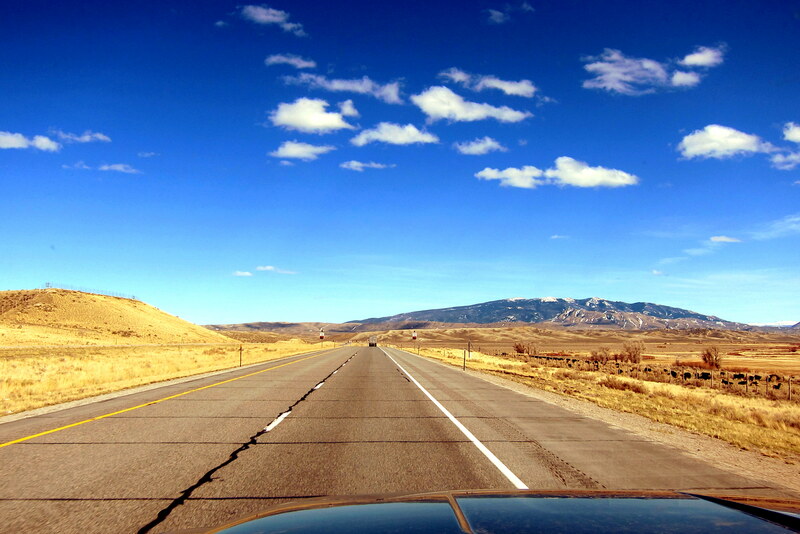 Friday, March 30, 2012-Cheyenne, Wyoming: Decided to take another day off the road so we could make contact with folks in northern Colorado that we wanted to see. While on base, we decided to take a look around. Warren Air Force base is home to the 90th Missile Wing responsible for the many ICBM sites spread about Wyoming, Nebraska and Colorado. It is the oldest active Air Force base and was originally established by the US Army in 1867 to help protect settlers and workers in the area. Interesting…..didn’t know that the ICBM even existed in the 1800’s. Anyway, the base is designated a National Historic Landmark and most of the early buildings have been restored. 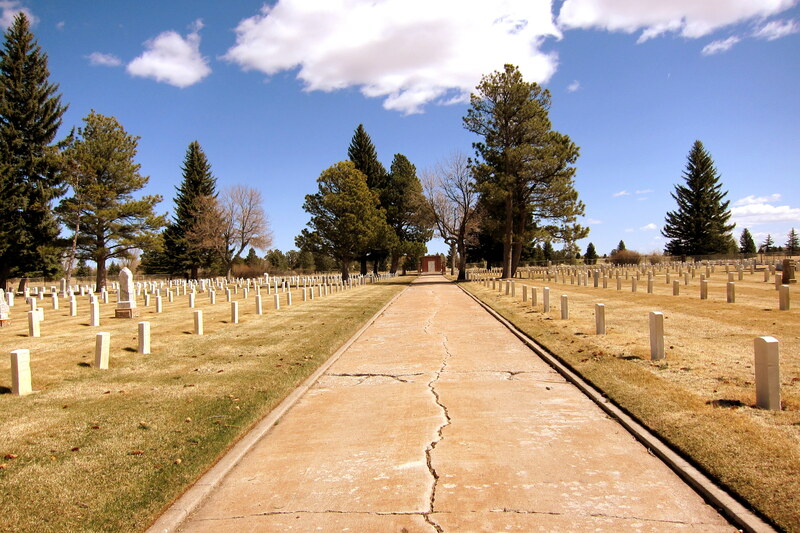 It also houses a very rare facility on an active US military installation……a cemetery. The base, back in the 1800 was very remote so any personnel that expired were interred within the facility. Although the cemetery is not in use today, it is still being kept up by base personnel and is listed as a historical landmark as well. Every once in a while, I notice an object that seems out of place and, therefore humorous…..well, at least to me. Such was the case at the gate to the cemetery. Not sure if this was for incoming or outgoing mail, but then again, does it really matter? Talk about trying to communicate with the dead. 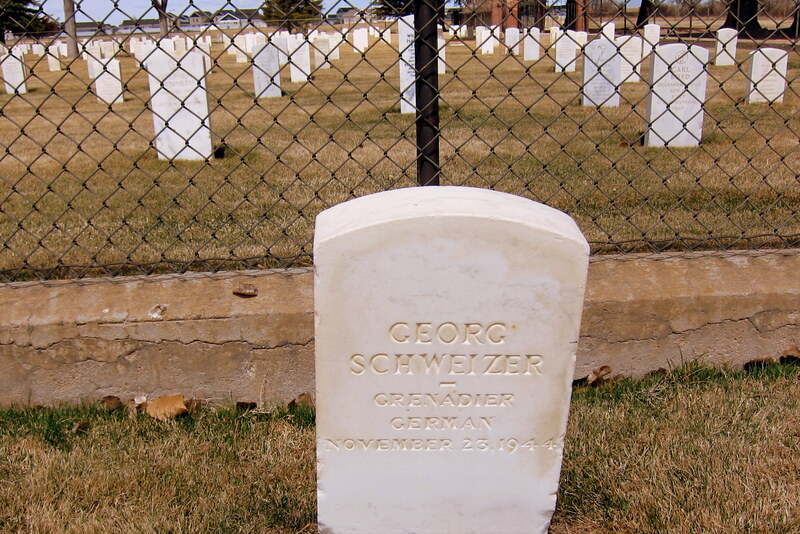 Another unique feature of this cemetery is a separate enclosed area containing nine headstones marking the final resting place of WWII prisoners of war. This base was one of many remote POW detention camps and some prisoners expired during their stay. After VE day, the base personnel offered to exhume these folks but there was nowhere for them to return home to so they remained on US soil. These are being kept up as well and receive the same dignity and attention as the US graves. 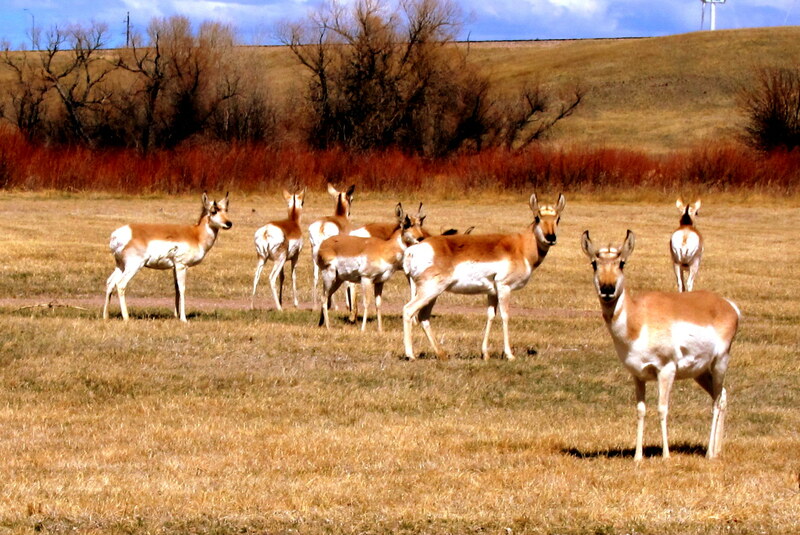 We also noticed that scampering about the base is a rather large herd of Antelope playing at home, on the range, without the deer…..guess they’re mad at them. 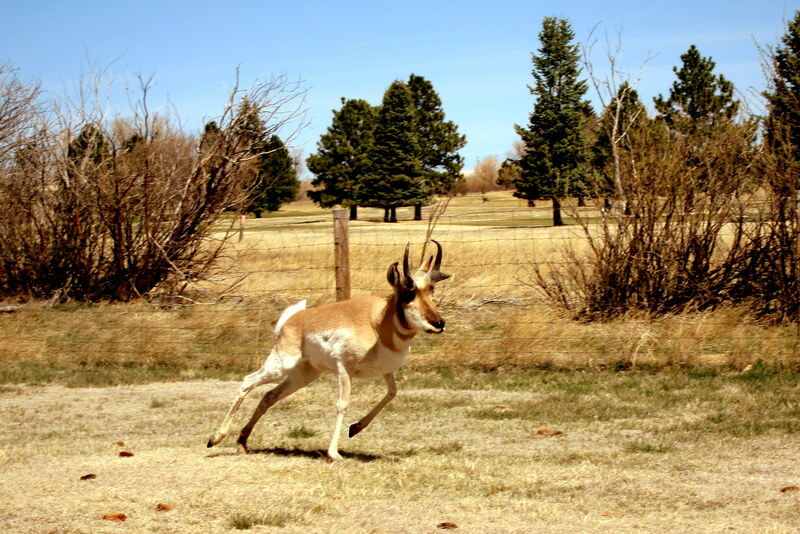 The buck seemed to be a bit agitated that I was getting a bit close to his posse. Not wanting to take the bull by the horns, I slowly backed off and went about my business. 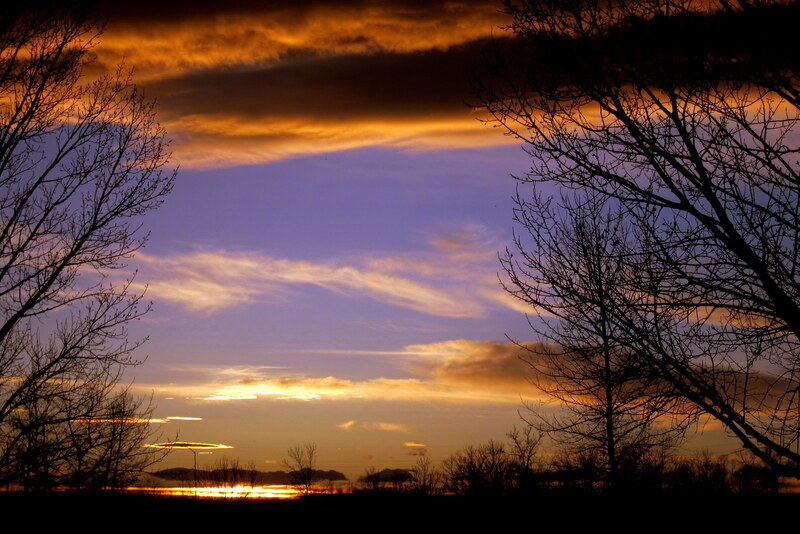 That evening, over dinner, we enjoyed a nice sunset over the flat plains of Wyoming. There is little ambient light in the area of Warren AFB that we are camping in, which makes for spectacular star gazing. While in Tucson, Dewey told me of a phone app called Google Sky which I have used many times since. The app is inexpensive to download and much easier to understand and use then a traditional star wheel…..I highly recommend it! Saturday, March 31, 2012: Woke to an unseasonably warm morning with temperatures projected to be in the mid 70’s. Last time we were in this area at this time of the year it was very cold, however Wyoming as much of the rest of the US is experiencing a winter that wasn’t. Hit the road at 1000 and found our way onto US-25 which took us south toward Colorado where we crossed the state line a half hour later. Nearing noontime we pulled off in Fort Collins at a nice rest area for lunch and to contact an acquaintance of our dear friend Henrietta. There are some items she would like picked up and delivered to her home in Minnesota, and since we are in the area and in a week should be in Minnesota, we volunteered to transport them. With the packages safely aboard we continued south toward the Denver suburb of Aurora for the evening. 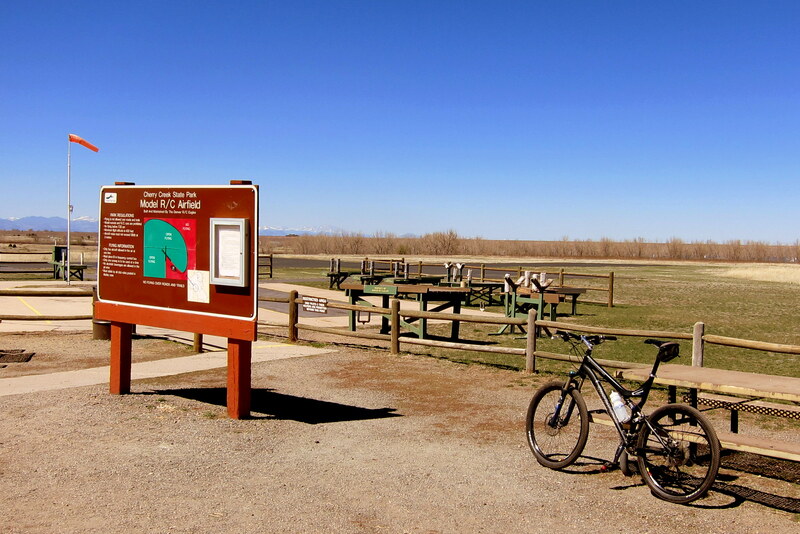 Locating Cherry Creek State Park, we selected a nice full hook up site on the edge of a meadow and within walking distance of the reservoir. After settling in, we made some calls to see if we could visit some friends and relatives that had relocated to the Denver Area. As it turns out, and much to our disappointment, Kit’s nephew, Josh and his family are staying a few weeks at their condo in Florida so we will not be able to visit with them this trip. However, the daughter of our old Navy friends Janice and Larry is available and invited us over for dinner. Off we head a few miles to the east and have an incredible visit with Lora, Gary, Billy and Sarah. The last time we saw Lora she was six years old and running the streets of Virginia Beach with our daughter Suzie. Laura is a former Army medic and currently a nurse working in radiology. Gary, a retired Navy submariner and diver, has had an interesting military career…..spending part of the time piloting a Deep Submergence Rescue Vehicle. After a very enjoyable meal and lots of conversation we returned to or camper for the evening. Sunday, April 1, 2012: WOW…..what a difference a day makes! Woke to this incredible sight!! 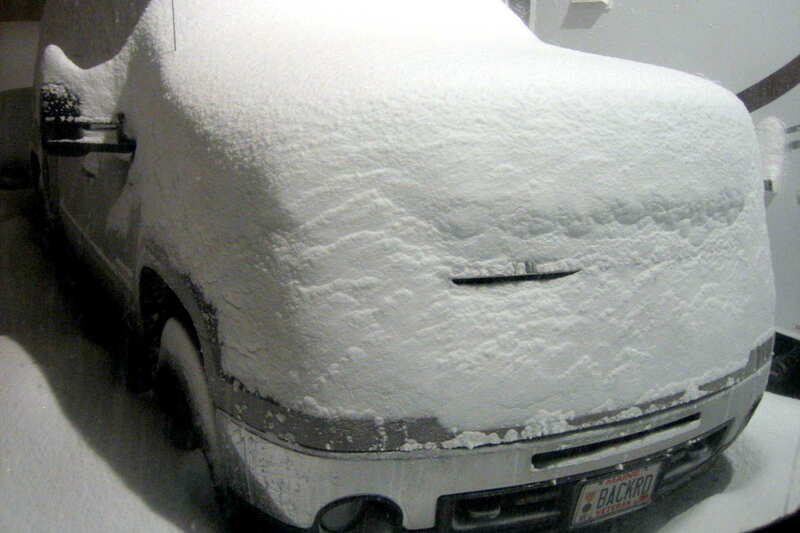 There is a truck and trailer in there under all that snow…..it’s also April 1st, funny how stuff like that happens on that specific day of the year?!?! It is actually warm and sunny so we decided to take another down day. Kit spent the afternoon reading and knitting while I took off on my bike to explore this 4,000 acre state park. The park features 35 miles of multi-use trails that wind through the woods and around the 880 acre reservoir, which on this, a warm weekend day, had plenty of activity. 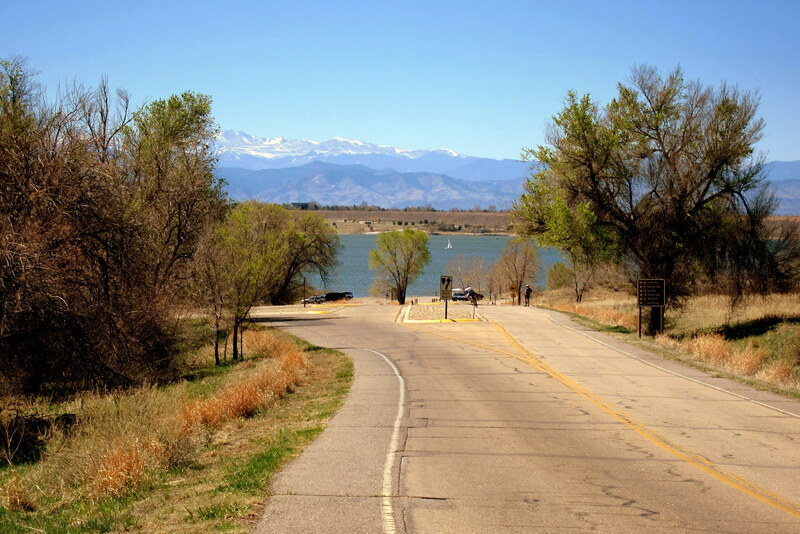 The lake is a man made reservoir, one of many that surround the city of Denver. 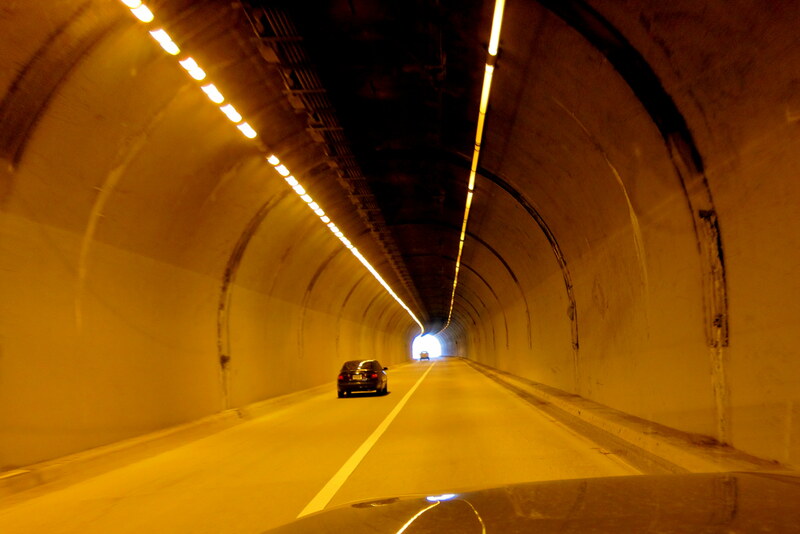 Most are filled by large underground aqueducts that gravity feed snowmelt from high up in the Rocky Mountains. The lakes are used for drinking water, firefighting, recreation and to minimize flooding from any rapid snowmelt. 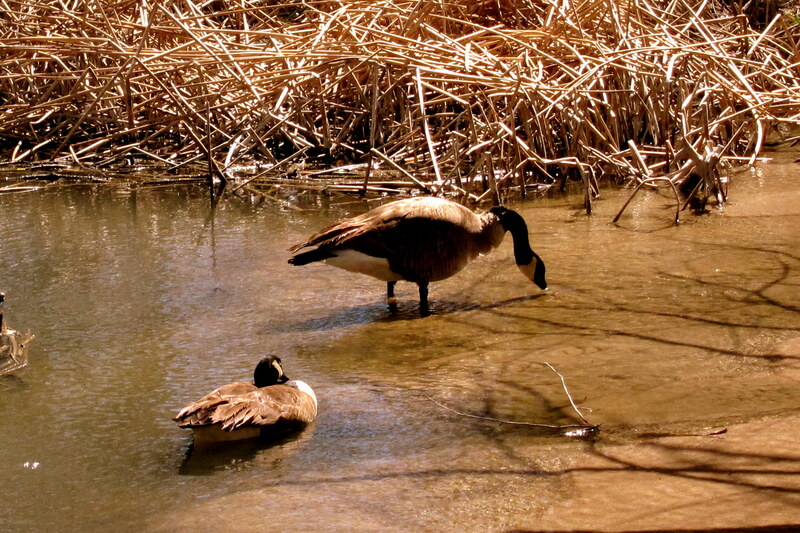 Came upon these two Canadian visitors enjoying the sun and water as well. Wonder where their Touque’s and Speedo’s are? This park in Denver’s back yard also features a model airplane field with an archery range close by…..must be an unusual sporting event in the making. There is also a gun range in a more isolated portion of the park. Returning from my bike ride, and finding Kit snoozing in her lounge chair in the shade, I quietly put the bike away. Then pulling out a few of my kites I made my way to the adjacent meadow to try the winds. Now generally the best flying wind is near the ocean…..strong and consistent. However due to the relatively flat terrain in this area I was able to enjoy a few hours of quality flying. 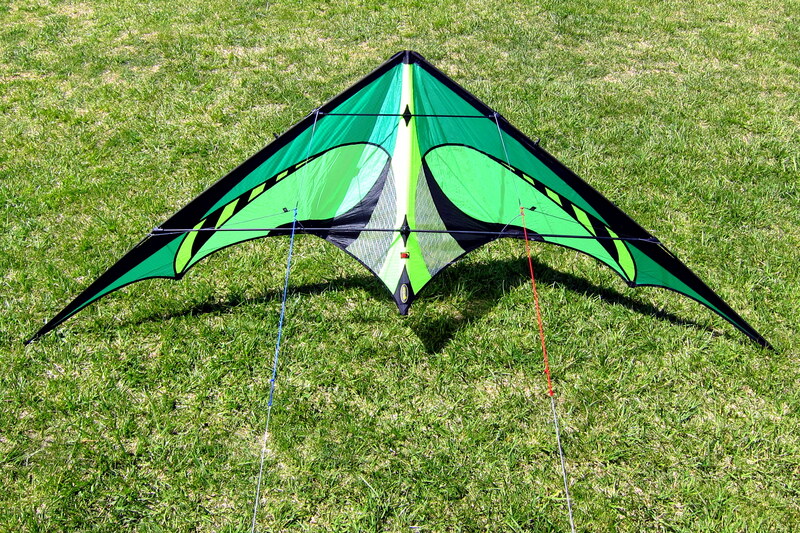 This is one of my newer kites. It is a very lite, dual line delta and is fast and responsive…..flies kinda like a bumblebee on steroids! What a blast! 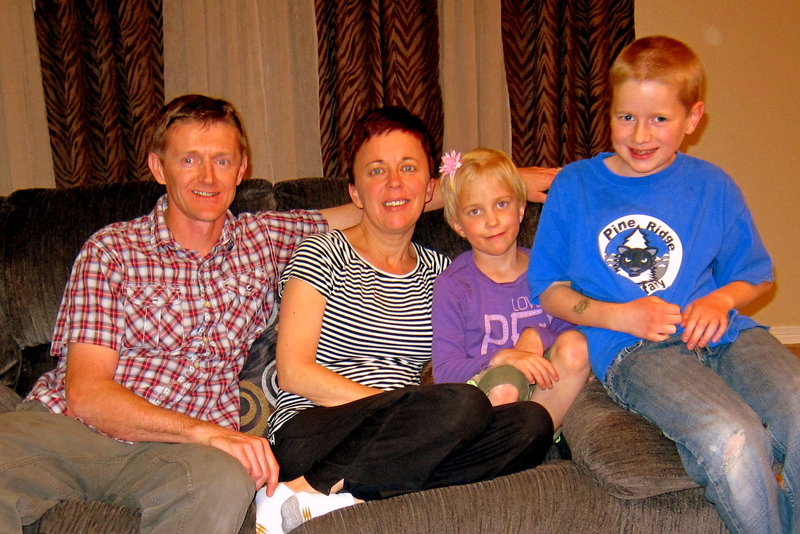 All and all…..a great stay in the Denver area, our only regret was the inability to see Josh, Cindy and Calista. 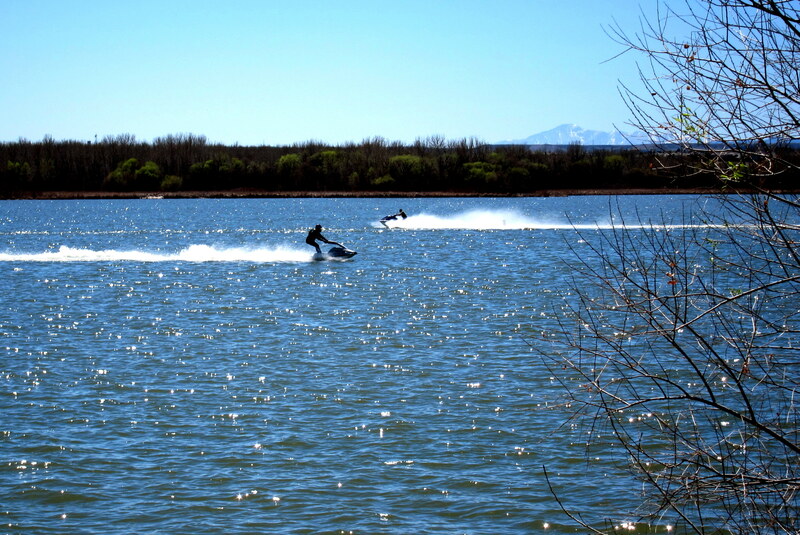 Monday, April 2, 2012: Pulled out of Cherry Creek State Park around 1000 under cloudy skies and temperatures in the 30’s…..yep, yesterday topped out at 79 degrees! In addition there was a very strong wind coming out of the north. Fortunately we were headed mainly east so other than a bit of buffeting, there should be little effect on our travels. Wanting to stay off the Interstates, we pieced together a variety of US Highways, County Roads and Farm Roads to make our way toward Iowa. 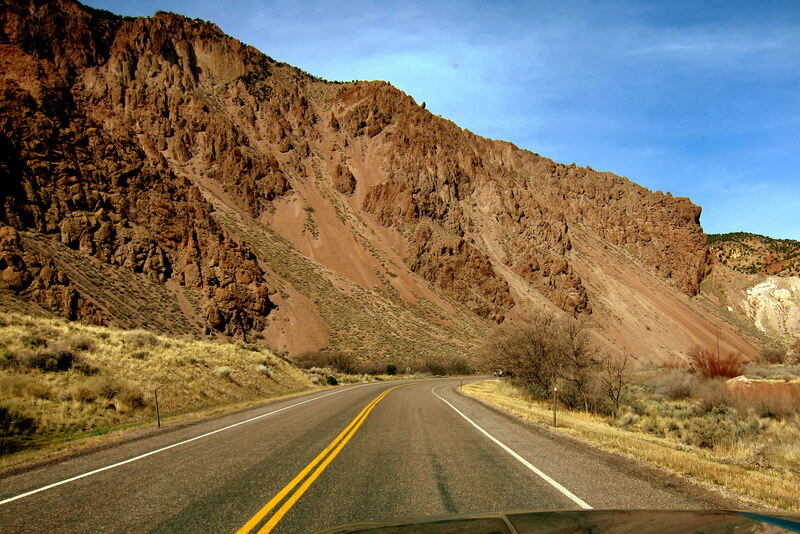 We were on US-70 heading east for about an hour before deciding to take CR-36 which soon turned to dirt. As you can see, the road was fairly smooth and we motored along without trouble for the next hour or so…..albeit trailing a large smoke screen worthy of a politician. 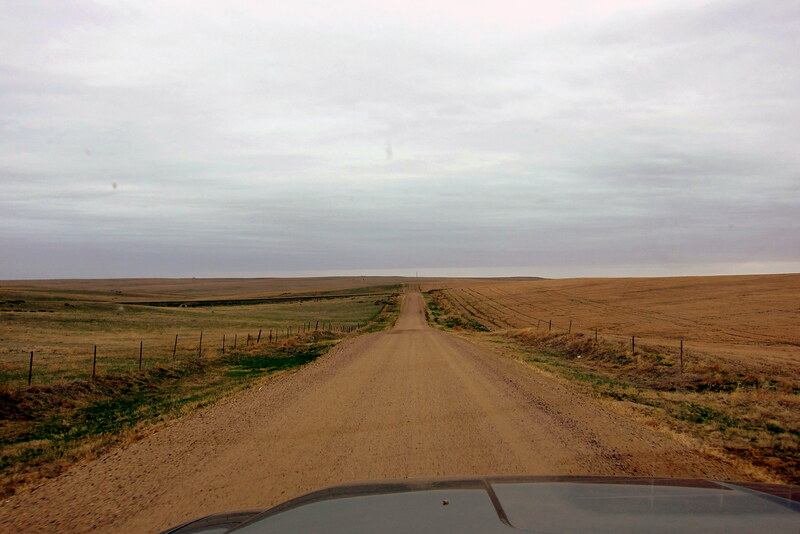 Frankly, this road was far more interesting than any Interstate. 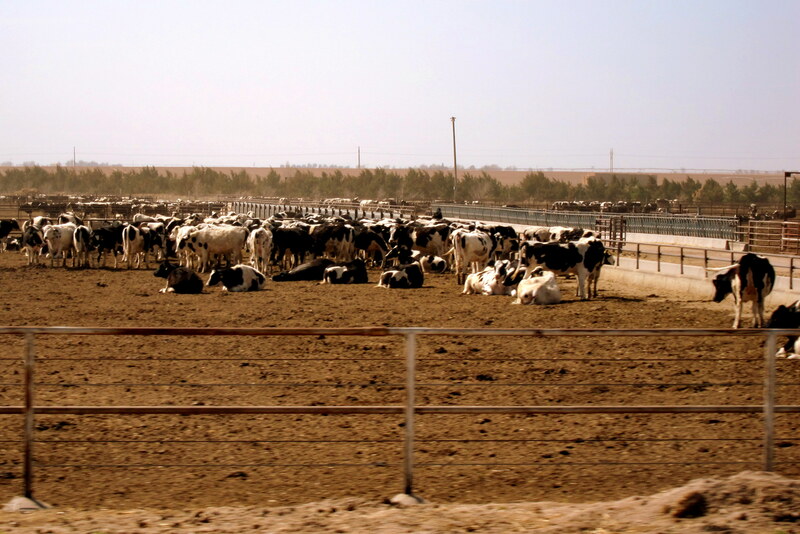 First there were the cattle yards…..another interesting political metaphor. 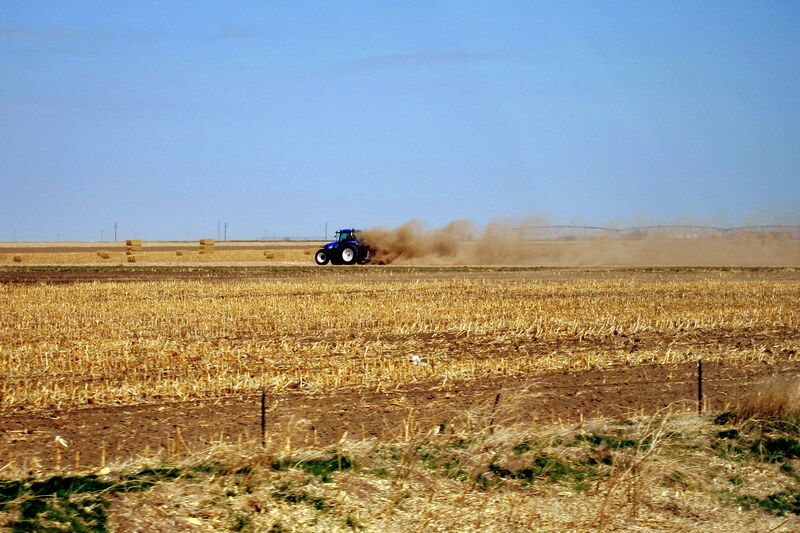 Followed by farmers getting their fields ready for the April 11th planting. Why April 11th? Well apparently in this part of the country any farmer that tempts fate by planting early will not be reimbursed by Government Crop Insurance if their efforts fail. 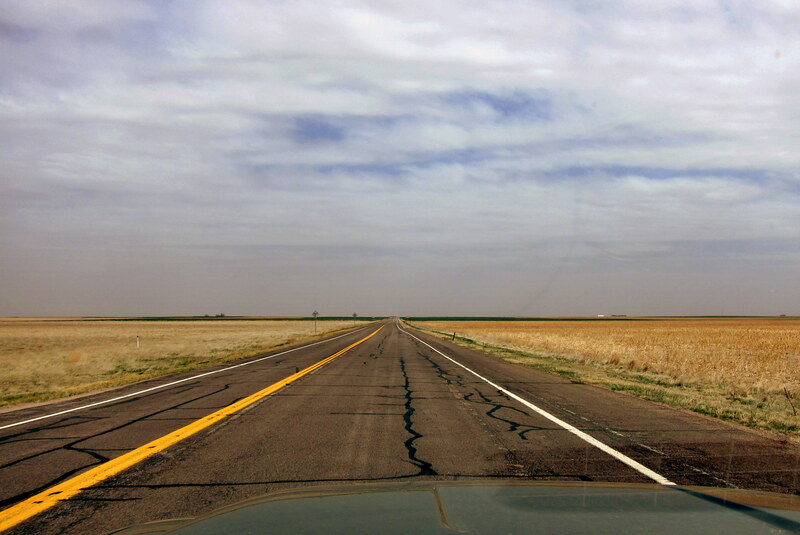 Intersecting US-36 we continued east toward Anton, population 20, and jumped on CO-385 known as The High Plains Highway. We soon wandered into Nebraska, and the Central Time Zone. 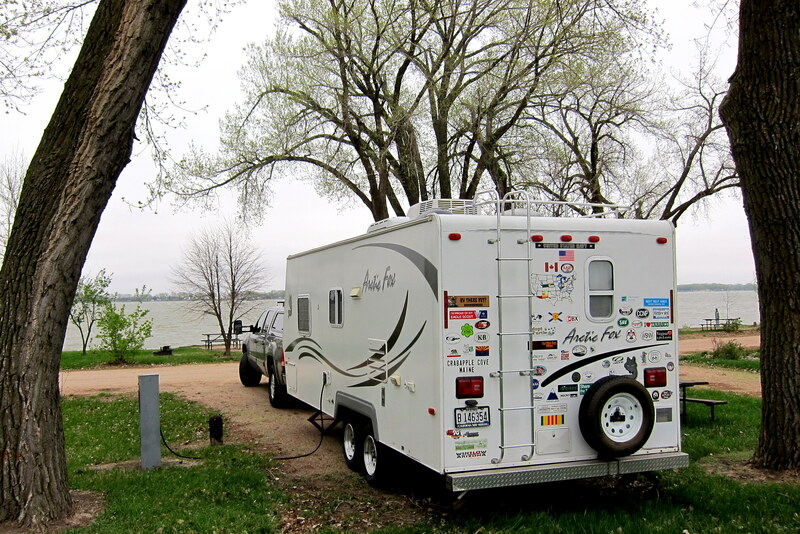 At 1945, dragging our keesters, we decided to pull off and stay the night at Johnson Lake State Park in Byers, Nebraska. The campground was empty and the water was turned off, however there were no closed signed so we picked a spot next to the water and settled in for the night. Tuesday, April 3, 2012: Up early and departed the campground under cloudy skies and a temperature of 42 degrees. The wind is still strong from the north, our direction of travel, so poor fuel economy is expected. Johnson Lake State Park looks like a great place to spend a few days in warmer weather. The lake is large and there are many homes and camps on the shore. We never did see anyone so we left a note with a check for $10.00…..hope that covers the stay. Stopped to fuel up in the small town of Bethel, Nebraska. We pulled into a service station that thoughtfully memorialized the creatures that gave their lives so we could bounce about the US in a 10 MPG vehicle. Within a half hour we crossed the Platte River and decided to hook up with I-80 to make better time. Shortly before noon, and tiring of the interstate boredom we moved over to US-30, continuing east and pulled over in Columbus, Nebraska where we treated ourselves to lunch at Dairy Queen. On the road and after a few hours we reached the town of Norfolk, Nebraska. 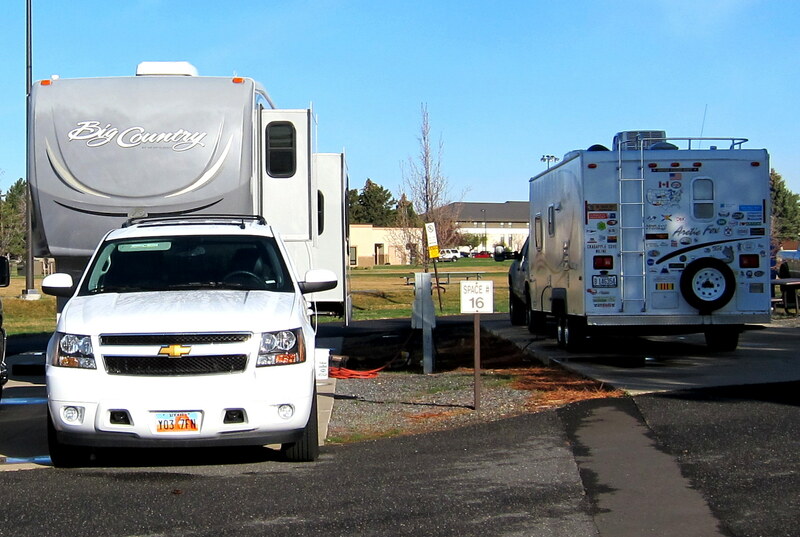 We traveled down the center of town on Johnny Carson Boulevard and pulled into a nice town park for a break. 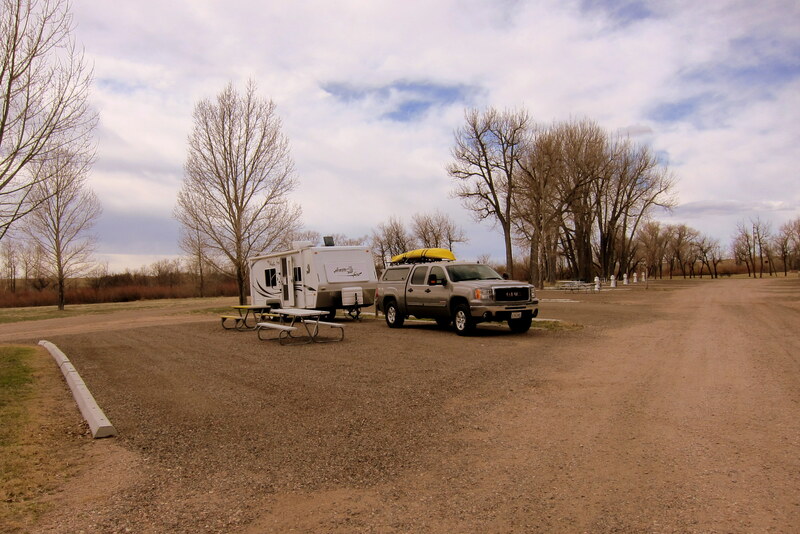 Stretching our legs, we discovered a brand new municipal campground had been developed adjacent to the park. In talking to the workmen we discovered that today was their official opening, though there were no campers yet. Fighting the temptation to stay and become known as the first ever to register, we motored on toward a rendezvous with our old Navy friends in Iowa. We spent the afternoon meandering through Nebraska farm country on US-20 before crossing the Missouri River around 1630 and then meandering through Iowa farm country on US-59. In order to humor myself, I decided to change the language of the truck’s Driver Information Center to Spanish. I then began to be informed of the vehicles, Odometro, Viaja, Radio Combust, Consumo Prom and Combust Consumido…..amazing the things that entertain the retiree mind! 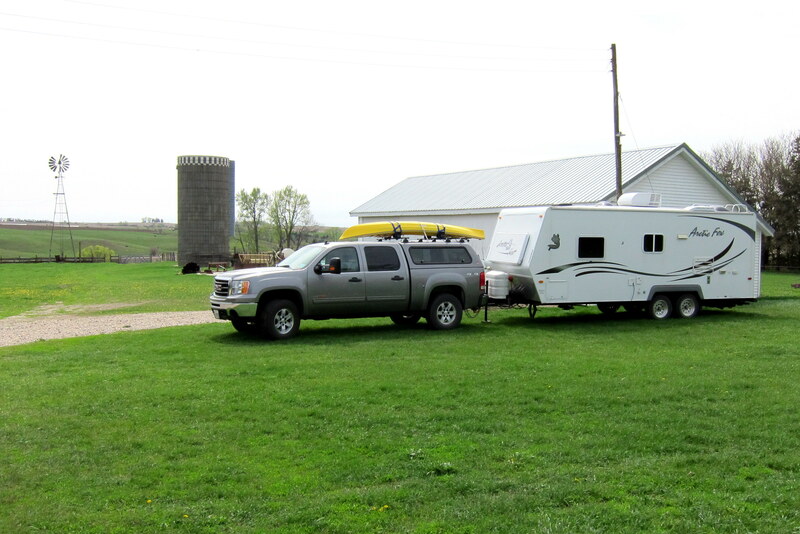 Fortunately, before experimenting any more with the truck’s many options, we arrived in Cherokee, Iowa where we accepted the kind offer to Farmyard Surf at my buddy Larry’s family farmstead. Stay tuned for the Adventures of the City Kid and The Iowa Farm Boy! Coming soon to an inbox near you!! 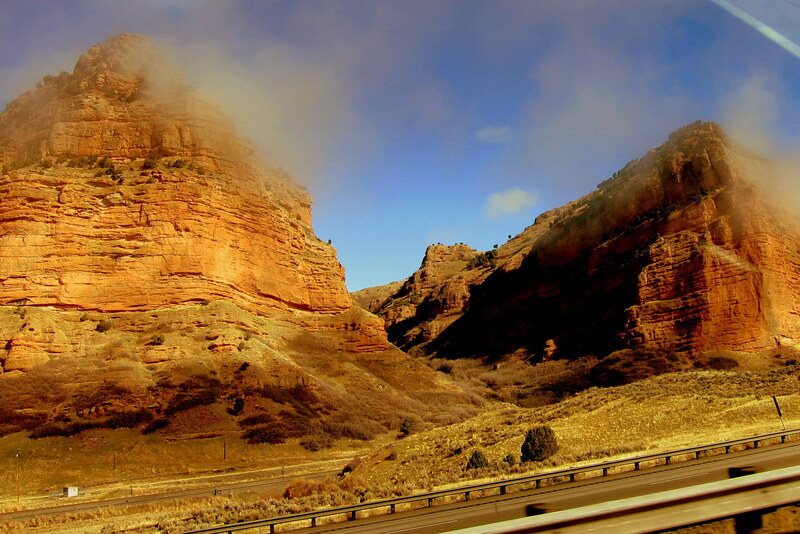 Kit’s Corner: We love wandering through the mountains and farmlands in the West/Midwest. It seems with every turn we make, we discover new and interesting things to explore and often meet real interesting people to chat with. I can’t imagine traveling any other way, at least for us. We miss some of the big city offerings (at least I do), but we find crazy things along the countryside to investigate. We were bummed to miss Josh, Cindy and Calista. It’s been 3 years since we’ve seen them. Next time, for sure. We enjoyed our visit with Lora, Gary and kids. We hadn’t seen Lora in nearly 40 years so had lots of things to catch up on. It was good to meet Gary and the kids for the first time and what a hoot with Sarah, who seems to be a clone of Lora when she was younger. Everytime I read your journal I want to be tucked in a corner of the Arctic Fox enjoying it all along with you! Be seeing you again soon in ME…at CP and Sebago. Travel safe!! We will be home soon…..getting anxious to see our kids, grandkids and friends! But first we (or, should it be I) need to explore some more of this great country of ours!! 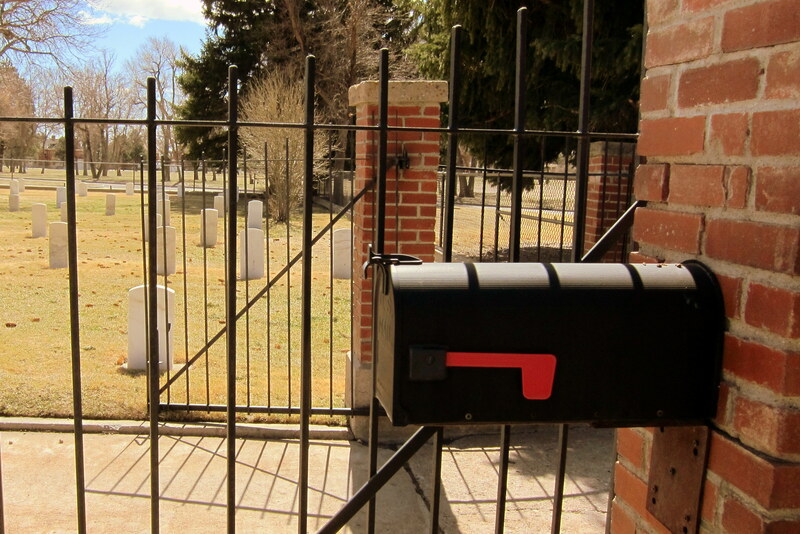 I have to agree with you Bill about the mailbox outside of the cemetery…..it does look totally out of place! The snow must have been a total shock. That I do not miss…….. Nor do we, that’s why we head south for the winter. Hope we didn’t head north too soon…..it has been cold up here near the Canadian border the past few days…..even some snow flurries! However the countryside is incredible!! THE BLACK AND WHITE BIRD IS A JAY AND THE PURPLE BIRD IS A MAGPIE. I NEVER KNEW THAT FEMALE ANTELOPE WERE CALLED POSSES. YA NEVER TO OLD TO LEARN. NICE WEATHER CONTINUES HERE AT HOME, SOMEWHAT COOLER BUT MUCH WARMER THAN NORMAL. I WAS SALMON FISHING LAST WEEK ON THE FAMOUS RESTIGOUCHE RIVER IN NEW BRUNSWICK CA. FISHING WAS VERY SLOW. HAVING DINNER ON SUNDAY WITH THE MONACO’S AND LANGSTON’S TO CELEBRATE JEANNE’S B DAY. I’LL SURELY BE A WALKING ENCYCLOPEDIA BY THE TIME YOU RETURN. BY THE WAY, THE BISON/BUFFALO ARE KATONKA ACCORDING TO MY BUDDIE KEVIN KOSTNER. Sounds like a nice fishing trip you had…..that area of Canada is incredible! Tell everyone at the Birthday Bash we said hi and are looking forward to upcoming events. Getting anxious to see the kids, grandkids and our friends…..however there are a few interesting spots we (I) want to explore as we meander home. Bill – you are right on your bird identification. 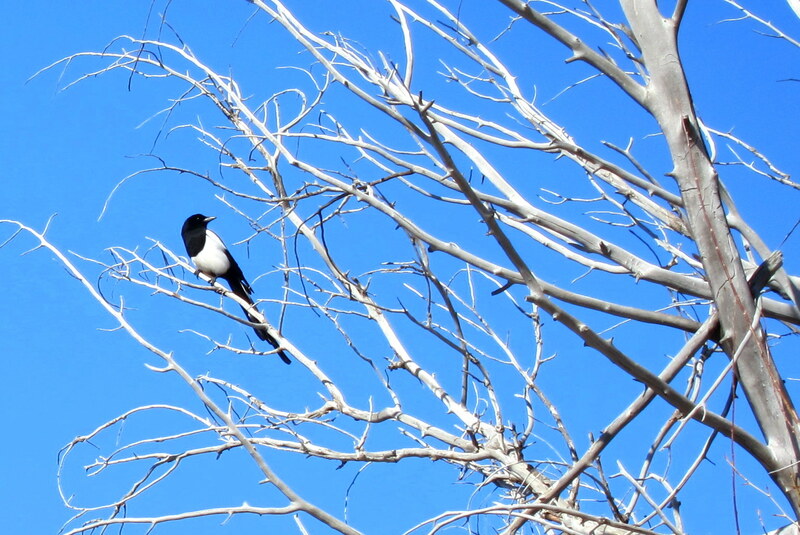 The first magpie I ever saw was in Denver many years ago. So far have not seen the jay yet. I will work on that. Thanks for the ID…..we enjoy watching birds and other wildlife dart about. Might have to invest in a better camera with a long lens to capture nicer photos, as you do. Heading home, should be there in a few weeks…..unless something interesting catches my eye along the way! Some great bird/animal pictures, especially with a small digital. I tooks some pics with my cannon sx from the kayak, some came out so so, but it wasn’t easy. Isn’t that I Bird amazing. Looking forward to seeing you fly the Delta. Thanks Bruzzin…..I appreciate the nice comment. Looking forward to seeing you guys in Maine this summer!